This fresh look at the philosophy of language focuses on the interface between a theory of literal meaning and pragmatics-a philosophical examination of the relationship between meaning and language use and its contexts. 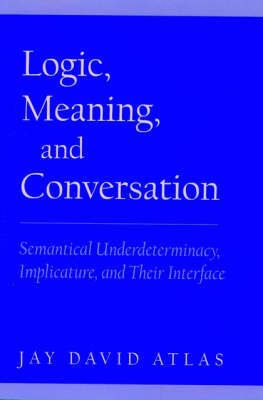 Here, Atlas develops the contrast between verbal ambiguity and verbal generality, works out a detailed theory of conversational inference using the work of Paul Grice on Implicature as a starting point, and gives an account of their interface as an example of the relationship between Chomsky's Internalist Semantics and Language Performance. Atlas then discusses consequences of his theory of the Interface for the distinction between metaphorical and literal language, for Grice's account of meaning, for the Analytic/Synthetic distinction, for Meaning Holism, and for Formal Semantics of Natural Language. This book makes an important contribution to the philosophy of language and will appeal to philosophers, linguists, and cognitive scientists.